The Colorado Rockies were defeated by the St. Louis Cardinals Friday night in the opening game of a three game weekend series between the two clubs, 7-5. The Cardinals recorded the first run of the game when Tyler O’Neill hit a solo home run off of Rockies’ starting pitcher Antonio Senzatela. The Cardinals managed to add two base runners, with Jedd Gyrko crossing the plate on a passed ball. From there, Cardinals starting pitcher Miles Mikolas proceeded to blast a two-run home run to right center field, putting St. Louis ahead 4-0 early. Senzatela bucked down in the second, third, and fourth innings, but was rattled in the fifth inning. The Cardinals added to their lead in the fifth inning, which started with back-to-back singles from Yadier Molina and Carlos Martinez. O’Neill then hit a double to deep center field to push Molina across the plate with Gyorko duplicating O’Neill later in the inning, making the score 6-0. Kolten Wong then hit a sacrifice fly which extended the Cardinals lead to 7-0. The Rockies answered in the bottom of the fifth which started with a lead-off single from Gerardo Parra. Charlie Blackmon then hit a two-run home run to right center field to put the Rockies on the scoreboard. Nolan Arenado followed with a solo home run to make the score 7-3. From there Carlos Gonzalez and Trevor Story each logged back-to-back hits. Ian Desmond then hit into a fielder’s choice, scoring a run with Ryan McMahon following with a RBI single to left center field, bringing Colorado within two runs. The Rockies put pressure on the base paths in the sixth inning, but were unable push a run across with two base runners and no outs. Colorado again had a golden opportunity to add to their run total with the bases loaded in the bottom of the eighth inning but failed to do so. 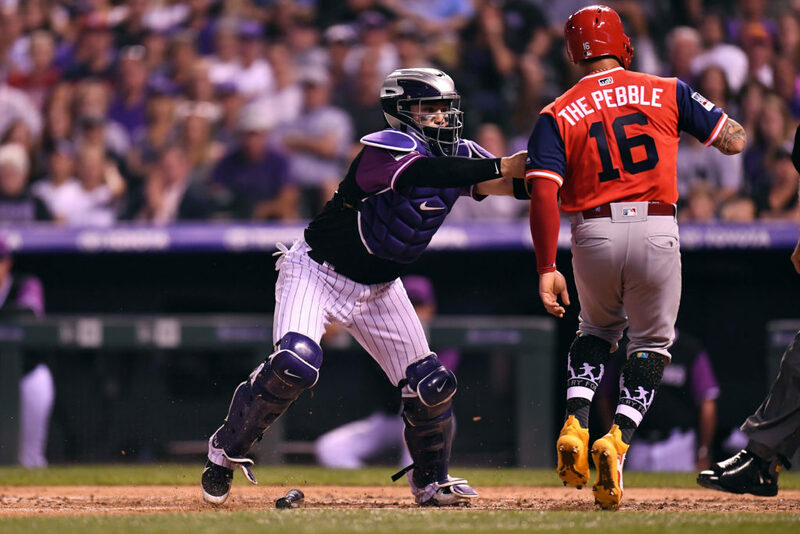 Ryan McMahon and Chris Iannetta both reached base in the bottom of the ninth inning to bring the go-ahead run to the plate; however, the Rockies were unable to take advantage of the situation. The Rockies and Cardinals will continue their series Saturday night at Coors Field with first pitch set for 6:10 MST.